Unavailable. This item is no longer available for purchase. 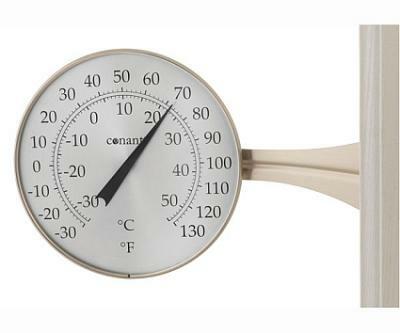 Large Dial Thermometer, Satin Finish - Conant Decor Collection (decor colors selected to match outdoor furniture and hardware). Large 8.5 inch anodized aluminum dial thermometer with glass crystal. Super-sized and excellent for viewing from a distance. Scale in Farenheit and Celsius, range from -30 to 130F. Includes reversible mounting arm & bracket, matching hardware. 10-year warranty. Thermometer can be calibrated.